Welcome to the "We Toss 'em, They're Awesome" Pizza Factory Franchise. We take pride in serving our guests the finest pizza with the freshest ingredients. The Fort Bragg, California Pizza Factory offers delicious homemade, hand-tossed pizza with quality ingredients and toppings. They also serve pasta, calzone, deli sandwiches, salad bar, sodas, beer and wine. 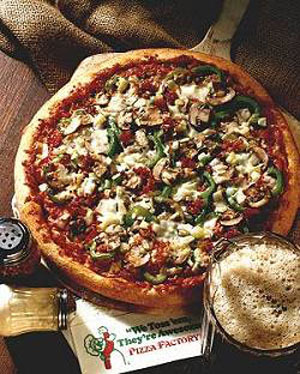 Their signature dough and spices are the "secret" to their award-winning pizzas. You can dine in the spacious oceanview dining room or there is pick-up or delivery to your room if staying within the Fort Bragg city limits. For special people - namely YOU! - there are all you can eat luncheons of pizza-by-the-slice, soup, chili and salad Monday - Friday from 11:00am to 2:00pm for $6.95. On Tuesday nites from 4:00pm - 8:00pm there is a Senior Special of all you can eat pizza-by-the-slice, soup, chili and salad for only $5.95. What are you waiting for! ?